Parushinee has every girl’s dream job. She is a professional personal shopper,fashion stylist,gifting guru and event planner. Running her lifestyle concierge business, My Go 2 Girl, she has her finger on the pulse of current trends. I first met Parush a year ago when she was working on a marketing campaign that involved macarons. We quickly realized that we were similar in that we were both trying to get our businesses off the ground while still maintaining our roles as full time wives and mothers. Parushinee has a great sense of style and class and it’s reflected in the work that she does and the unique and creative concepts that she comes up with. 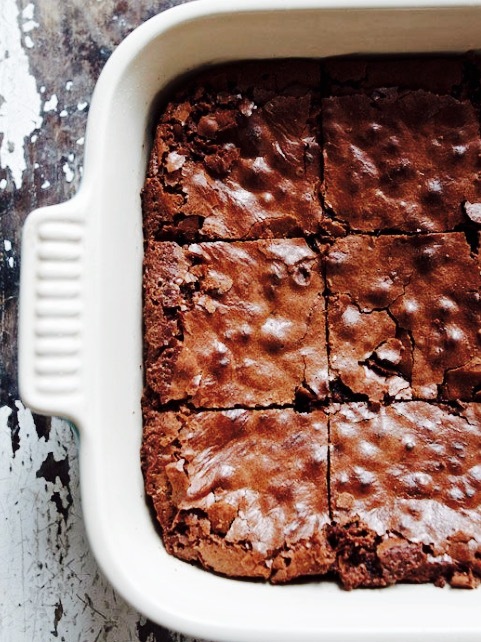 This week she is sharing with us her decadent but simple recipe for Chocolate Brownies. What more could you ask for! INGREDIENTS Sugar, chocolate, vanilla and eggs….these are a few of my favourite things. I was a late bloomer when it came to baking. Confronted with my daughter Shyla’s first birthday, I decided to try and bake my first cake, ever. I’m sure my husband still has nightmares about that day, but 7 hours later, I had a fairly pretty, though somewhat lopsided butterfly cake. I have come a long way since then and now the creaming sugar and butter is second nature. I love the science of baking, the anticipation, the smell that fills my kitchen and the challenge of presenting something that tastes and looks amazing. I must say though, I love simple recipes that turn out to be fabulous masterpieces. That’s why I love my chocolate brownie recipe so much. It’s a one bowl recipe, which I so do love because it means minimal clean up. The real beauty is in the brownie itself….the gooey chocolate centre! I hope you enjoy this recipe as much as I enjoy making it and eating it. Cream butter and sugar with an electric mixer on medium speed. Sprinkle in cocoa powder and mix until combined and has a gooey consistency. Leave to cool for at least 30min before slicing. Alternatively you can make this ahead of time and store in the fridge. Be sure to let me know if you’ve tried the recipe and how it turned out.